November's edition of the Etsy Handmade Division Team's Talk About blog is focused on masters of your trade with whom you would like to study. What a marvelous theme!!!! Who doesn't have people that they really look up to and aspire to in any craft?! And, of course, I am thrilled to have a chance to talk about those ladies (and gentleman) who I consider to be beadweaving masters. 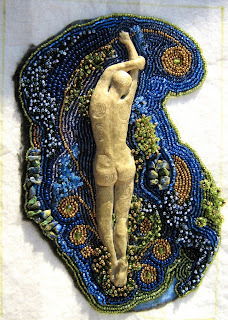 First is Ann Tevepaugh Mitchell, who creates the most amazing figures out of beads that I have ever seen. Ann evokes so much emotion with her art that it leaves me breathless. Her colors, her 'found' objects, her mastery of peyote; all combine to form something above and beyond. Her realistic human figures are made with beads combined with materials such as stones, glass bottles, and shells. My absolute favorites are Kosovo and Refugees. In Refugees, the bugle beads used to convey the burdens that the figures carry are so bristly that you are sure that if you touch, you'll get pricked. In Kosovo, you can almost feel the soft wooliness of the fabrics she has shown in beads. I would be honored to study under Ann, an incredibly visual and tactile artist. 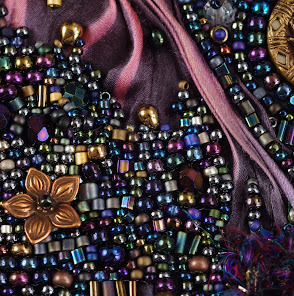 If you haven't seen Ann's work, I encourage you to get a copy of Lark's Master Beadweaving book, which includes Ann, as well as other 35 more amazing bead artists. David Chatt would have to be my next Master - not only is his beadwork incredibly architectural, but he chooses the coolest things to bead!! Artist in Residence is my absolute, hands-down favorite piece of his. The fact that the house opens up, and the way it opens up, and the chair that sits within - !!!!! And of course, his Breakfast Set; who but David would think to bead eggs, bacon, toast (complete with pat of butter), napkin, et all??! And it all looks yummy enough to dig right into. He blows my mind. Then there is Linda L. Jones. Her color work is brilliant. Her work is also very tactile, with bumps and ridges and large beads that you just want to caress (many of these polymer clay beads are her own originals as well)...and the shading in some of her embroidery pieces makes it look as though you could jump right INTO the work and find yourself in a completely different world. Her work Radiance is so subtly full of grace that at first you don't notice it, you are just completely blown away with the quality of the beadwork...but the longer you look, the more you feel. NanC Meinhardt is another Master I would adore to learn from. Her use of form and color make me want to jump around and celebrate. And frequently ask "How did she DO that?" too. Some of NanC's pieces are kind of warm and fuzzy; here I am thinking of her Fable Vessel, where some of the fringing looks almost like yarn, while other's are hard, spiky and almost angry (Sssssssnake springs to mind). One of the many things I admire is NanC's complete and utter abandon with her beads. How I would love to let my beads take me there! And that is the common denominator amongst all three of the people I chose to highlight today; their work makes me feel: whether I am giggling, hungry, angry or trying to hold back tears, their pieces all emotionally affect me. For me, that has always been what true Art is about - it makes you feel, it touches you; you don't look at it, like it, and move on - you come back to it time and again either in the physical world or in your head, and you think on it, because it made you feel. I'm going to leave you with one of Linda's pieces, but I'm not going to say how it affects me; you have to feel on your own. Don't forget to check out all the other team members' blogs to read about their Masters, too!! Great post! I like art that moves me, also. I love these Handmade Division theme posts, they're always so thought provoking! I don't deserve this honor, Nancy. But I thank you for thinking so.